AOL’s Patch has acquired hyperlocal news aggregator Outside.In, we’ve confirmed with Patch’s president Warren Webster. It’s unclear what the terms of the deal are but Business Insider reported earlier that the acquisition is valued at less than $10 million. Outside.In has raised $14.4 million in funding to date. Webster tells us that Outside.In, which has a previous relationship with AOL, will be integrated with Patch, the company’s hyperlocal news platform. The New York-based Outside.In is a local news aggregator aimed at bringing together all the hyperlocal news around a given location. Via its search portal, you simply enter your zipcode, neighborhood or address and the site will surface the most relevant news in your particular area. Outside.In focuses on sourcing information and news from local bloggers as opposed to large publications. The startup has raised funding from Union Square Ventures, Milestone Venture Partners, the New York City Investment Fund, Marc Andreesen, Esther Dyson, John Seeley Brown, John Borthwick, and George Crowley and others. Considering Patch’s hyperlocal focus, the integration of Outside.In’s it makes sense from a technology standpoint. 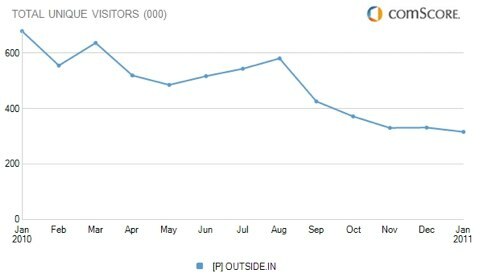 Outside.In’s traffic has been declining over the past six months and only saw 317,000 unique visitors in January, according to comScore. In addition to the coverage that Patch reporters provide in a given area, Outside.In will be able to supplement news with its search platform, and scale coverage. It’s no secret that AOL has been aggressively looking to expand Patch’s coverage and reach. This isn’t the first exit for a hyperlocal news aggregator. Chicago-based EveryBlock was acquired by MSNBC back in 2009. And of course, AOL bought Patch in 2009 as well.